Very popular tea time snack of South India. In a large bowl mix Rice flour, red chilli powder, salt, jeera, hing, Coconut & melted hot butter. Add water & make a dough. Take a small ball of the dough & roll out into a medium thick strip. Roll it into a round shape & stick the ends together by pressing it tightly. Keep the remaining dough covered. 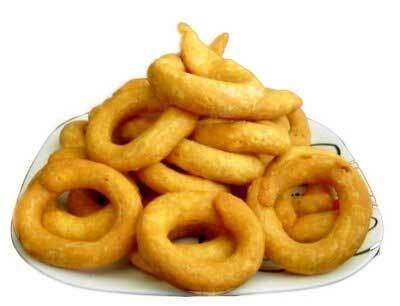 Prepare a batch of 5-6 rings & deep fry on medium heat till they are golden colour. Cool them completely without over lapping the fried rings. Store in an air tight container & serve with coffee or tea. Thank u devika. Rachana u can store these for 8-10 days & in an air-tight container for 15 days. Latha i dont have ur mail id. (1) Try adding 1/2 cup roasted fine rava. (2) U have to knead the flour well by applying oil to ur palm. If the oil dry up, again apply some oil. Knead well & keep the kneaded flour covered. If u dont knead well, it will break while frying. Sorry for late reply, coz of some technical probm i was not able to send comments for a long time. Hope this will help u latha. Thanks. Hi Soujanya, Just one question-How long can you store these?? Thanks..
Hi, Soujanya.. Just a query to ask-how long can u store these? Hi, As per your receipe I did try this but unfortunately it turned out to be soggy/rubbery, not even a single one came out crispy. Can you please advise where it went wrong ? Otherwise taste was ok. Can you advise to my email id. Waiting for your advise. Hi foziakauser...fresh coconut gives taste & softness. If its not available, u can use frozen shredded coconut but thaw them well to room temp. before adding to the flour. thanks for sharing yummy recepie with us. is there any alternative of fresh coconut or can we use grated/shreded coconut instead fo fresh coconut. Hi rupa...its not required. If u like u can roast it but it tastes good without also. by rupa hi jus wanted to know that do u have to roast the rice flour before kneadg the dough. hi soujanya, just a small suggestion.you can grind coconut,dry red chillis and l.g powder and add the paste to rice flour to make kodbole.this way you dont need to add butter as coconut will leave oil.my mummy makes like this.